At day you have to wrangle with legacy code, fix bugs, struggle with APIs, deploy services and integrate things. Yet you wish you could create worlds, animate dragons, break laws of physics and design artificial intelligence. You can. 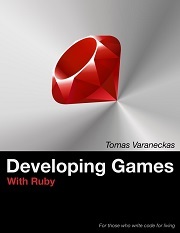 If you have a little experience programming in Ruby or another language, then you're ready to start making your own video games. In this book you'll learn concepts such as animation, keyboard and mouse movement, sounds and music, and physics as you build exciting games. So, your game will have to be small enough for you to be able to complete it, it will have to have simple 2D graphics, and would not require the latest GeForce with at least 512MB of RAM. This fact gives you the benefit of choice. You don’t have to worry about performance that much. You can choose a friendly and productive language that is designed for programmer happiness. And this is where Ruby starts to shine. It’s beautiful, simple and elegant. It is close to poetry. When you're done with this book, you'll have improved your programming skills, and you'll have all the tools you need to make your own arcade-style games. Welcome to the world of game development that was waiting for you all these years. Tomas Varaneckas is a generalist software developer with over a decade of experience, for last several years focused on keeping things up and running in production at scale, implementing and promoting DevOps practices. Part time Game Developer, and founder of Game Hero indie game developer community portal.